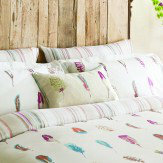 Inspired by the Amazilia wallpaper feather motif - this pretty, delicate motif makes a relaxing bedding set. Created in 200 thread count, cotton sateen for a soft feel. Do take a look at the wallpaper collection too, also available at wallpaperdirect.